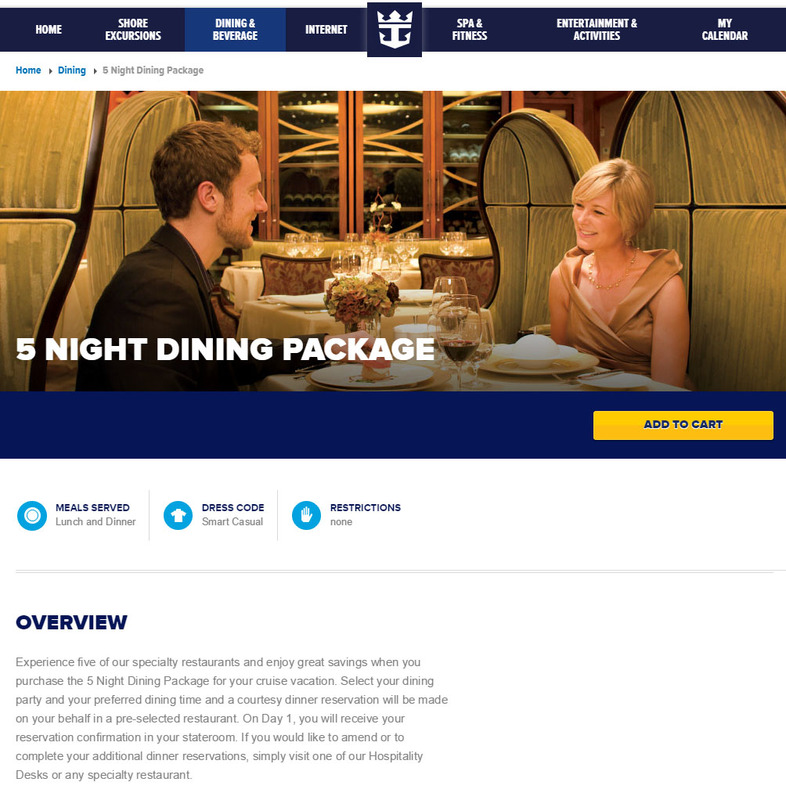 Royal Caribbean has started offering dining packages on select Allure of the Seas sailings, that allow guests to enjoy multiple specialty restaurants for a fixed price. Guests that reserve a dining package will be asked to select their dining party and preferred dining time. Royal Caribbean will then make a courtesy dinner reservation will be made the guest's behalf in a pre-selected restaurant on day 1 or day 2. On Day 1, guests will receive reservation confirmation in their stateroom. Guests are able to amend or to complete additional dinner reservations by visiting a Hospitality Desk or any specialty restaurant. For restaurants with a la carte pricing, package includes a $30 credit towards the food portion of your bill. Kids ages 6-12 dine at specialty restaurants for only $10. Ages 5 and under eat free! Royal Caribbean staff can add kids to existing reservations at kid's prices once onboard. Earlier this year, we have spotted similar dining packages offered on Explorer of the Seas and some Freedom class ships. It is not clear yet if these dining packages are available for all sailings yet. Royal Caribbean Blog reader Calvin Harris spotted the deal offered on his December 12, 2015 Allure of the Seas sailing. UPDATE: Royal Caribbean Blog readers have spotted similar dining packages on Oasis of the Seas, Anthem of the Seas & Serenade of the Seas. Will you book one of these dining packages for your next Royal Caribbean cruise? Tell us in the comments below!